Jack Beaumont has reset his focus on making Great Britain's squad for the Rio Olympics, weeks after sustaining a career-threatening back injury. 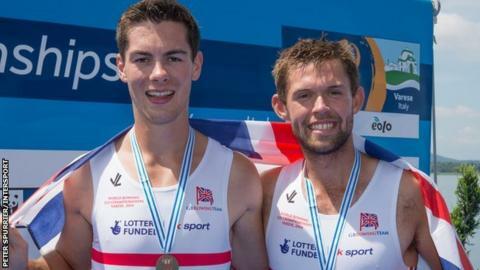 Beaumont was hit by the men's eight boat while he and double sculls team-mate Angus Groom were on a Team GB training camp in Portugal in August. The 22-year-old from Maidenhead feared he might not walk again in the hours after the accident. "It was a frightening experience," he told BBC Radio Berkshire. Beaumont was kept in hospital in Portugal for more than two weeks after the head-on collision at the Aviz Training Centre and missed the World Championships in Aiguebelette, France. "The collision happened and I knew that something had hit me in the back," Beaumont added. "We capsized and I fell in. I was bleeding a lot and straightaway had a huge lump in my back." The European bronze medallist admits he feared for his career in the immediate aftermath, adding: "I didn't think I would row again for the first hour or two. "Firstly, it was 'will I survive?' Then 'will I make it out of this water?' Then I started to think 'will I walk properly and will I be able to play with my kids?" Beaumont was braced for a long lay-off, but was surprised when doctors revealed he would be out for just three months. He has returned to light training following support from specialists at Bisham Abbey's intensive rehabilitation unit. "I think I've got off lightly. Rio is still very much the aim," he said.